Not just your average church choir girl, Lauria, is a true singer at heart. As long as she can remember, singing has been her birthright. She paid her dues, she rocked spiritual pulpits to the hardwood stage in her high school to the social stage of YouTube, all while taking singing lessons to hone and master her God-given instrument. Currently studying at Concordia University in Montreal, she spends her free time in her favourite place… the studio. It’s her euphoric happy place, where she turns nothing into something special. She wants her fans to connect with her through her music. It is that connection that unites all of us. 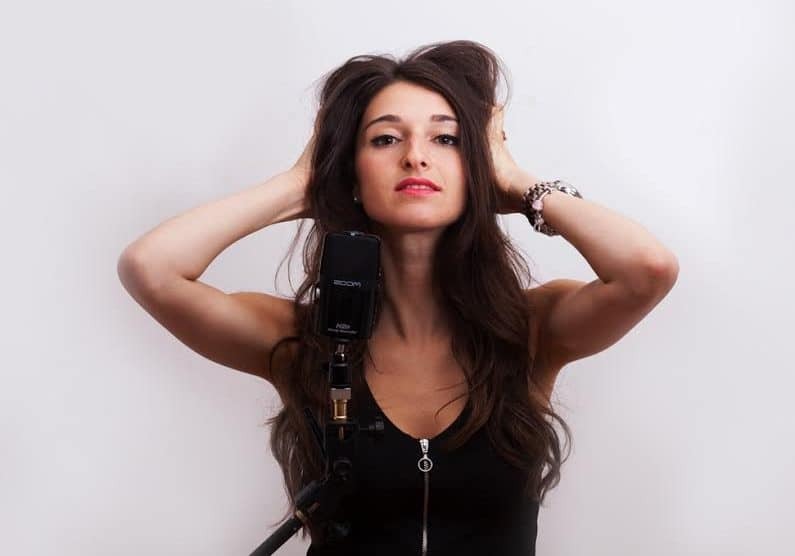 Lauria, shortened from her full name of Florie-Laure Zadigue Dubé, dropped her single, “Losing Me” in 2018. It is gaining traction as she is being recognized as one of the youngest, more thought-provoking, intriguing and enigmatic artists in her field. You need to find her at your next event. A degree from McGill in Science & Architecture didn’t quite fulfill the creative soul that dwells inside of Dana Ben David. So she found herself at the renowned Harris Institute in Toronto where she later graduated with a diploma in Audio Production. She can be seen on your TV screen, various theatre stages, and several venues across the country. She also performs for Toronto-based entertainment companies, weddings, and corporate events. Her passion is fueled by collaboration. She is drawn to the creativity in other artists, as every true artist is. Dana continues to develop and hone her sound and is finding success at every turn as she becomes the singer/songwriter she was meant to be. She wants her journey to energize and inspire other artists as they go through their own journeys of realization. Music, art, creativity is universal and something that each of us tap into in some for or another. This is why collaboration is a great part of what she does. She is a rising star that you best not turn your back on. Shanty Sweets is a neo-soul, roots reggae, jazz (with a mix of ska) performer from Toronto. Her versatile style, or “versastyle”, shows through effortlessly allowing herself to float through the many different genres mentioned with ease. With many years of experience and a deep love for music, she knows how to keep an audience entertained and on their feet. At the age of 16, she discovered her passion for music and her gift of an alluring voice while experimenting in her father’s recording studio. Alongside her bandmates, Shanty has performed at many events and venues all throughout the T-dot, such as the AGO (Art Gallery of Ontario), The Carlu for a show sponsored by Western Union, The Globus Theatre (Bobcaygeon), Atria (Oshawa) and the heart of the city, Nathan Phillips Square, just to name a few. She takes pride in always putting on a good show for her audience and strives to spread wisdom, inspiration, and create an uplifting feeling through her music. Her influences run the gamut of excellence. They include: Nina Simone, Alanis Morisette, Norah Jones, Tracy Chapman, Ella Fitzgerald, Marcia Griffiths, Leela James, Beres Hammond, Goapele and many more. Sluka, hailing from San Diego, has recently released his 11th album, “Colorful Radiation“. He has been referred to as a “Modern Day Renaissance Man”. All instruments played on CR were played by him. Read the featured article on our city site, Mobtreal, here. Born near Seattle, Christopher Sluka had a multinational upbringing as he was raised all around the world, with his family never spending more than a couple of years in any one place — this life experience is evident in his cosmopolitan musical sound. Over the years, after building up a large international fanbase, Christopher’s visionary style has developed and matured, yet he remains enigmatic by keeping a focus on creative songwriting, while building an international reputation for his enthralling live performances. Californian singer-songwriter, Eric Anders, released his ten-song anti-Trump album, Eleven Nine, in the Spring of 2017. He also just released his new EP, Recoveries. He is donating all of the album proceeds from Eleven Nine to Lambda Legal. True money-where-your-mouth-is activism at it’s best. Eric got into writing and recording songs in his late thirties and then tried to make up for lost time by releasing four critically acclaimed CDs in four years: Not At One (2003), Songs For Wayward Days (2004), More Regrets (2005), and Tethered to the Ground (2006). After taking a five year break to get married and have a few children, he released Remains In Me (2011) followed by Big World Abide: The Best of Eric Anders (2016). In addition to Eric’s songs being heard on radio all over the world, his song “So Wrong” from Tethered to the Ground was used in the 2007 Michael Schroeder film, Man In the Chair, starring Academy Award, Christopher Plummer. Eric was inspired by Michael Apted’s 1992 documentary, Incident at Oglala, to write the politically charged songs about Native American’s history of oppression in the U.S.
On 11/9/2016, a day that will live in infamy, Eric, now an established family man in his fifties, knew he had to take a break from promoting Big World Abide and get to work on some new songs to make his third political CD: an anti-Trump ten song LP, which he decided to name Eleven Nine after that day and in reference to that other cataclysmic day for America, 9/11. Read the featured article on our city site, MobAngeles, here.